1. Check to confirm you received all the parts and that they are the correct size. New doors normally come with the barrel assembly and curtain separate, along with the tracks and hardware box with instructions. Sometimes the endplates are separate. 2. Install the tracks. 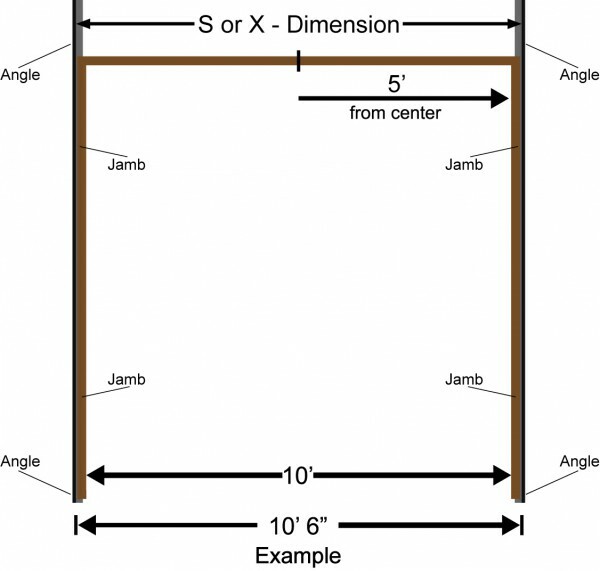 Depending on the jambs the longer angles may need to be separated from the guide angles. Also, if the upper bellmouths are welded to the tops of the tracks, the guide angles will need to be separated at this time. 3. Determine the S or X dimension. This is the dimension between the vertical mounting angles which support the tracks and end plates. 4. Measure and mark the jambs. 5. Secure the angle on each side. Both angles must be plumb, level, and evenly spaced according to the S-dimension at the top and bottom. This is absolutely critical for the door to operate smoothly. 6. Install the curtain onto the barrel. 7. To prevent the outside of the curtain from getting scratched, unroll the curtain onto plywood, cardboard or two 2 X 4s or 2 X 6s. 8. Go to the top of the curtain and position the barrel just beyond the top of the curtain. 9. Determine from the instructions, your order, and from markings on the barrel which end is the drive end. The shaft on the drive end does not have a bearing in the end of the barrel; the winding end does have a bearing. Turn the drive end so it is on the correct side of the curtain. 10. If barrel rings are in the box install them at this time. Some barrels do not have rings, and some barrels come with the rings already installed. 11. Install both end plates. The plate with the bearing goes on the drive end, and the plate without the bearing goes on the winding end. 12. If the door comes with a hand chain drive install it at this time. 13. Sometimes the top slat has holes to secure to the barrel, and sometimes there are several short starter slats to align with each barrel ring or with the holes in the barrel. If you have several starter slats, slide them into the top slat at this time. 14. Position the barrel over the top of the curtain, lift the top of the curtain up to the barrel, and secure the starter slats to the barrel rings or to the barrel. 15. Roll the curtain onto the barrel. You do this by turning the drive shaft, and by pushing, pulling and rolling the curtain. 16. Tie and secure a strap around the center of the curtain. 17. To protect the curtain place two 2 X 6 boards on top of the forklift blades. 18. Lift the center of the door and see if one side is heavier. If so, move the forklift to support the balance center of the curtain and barrel. 19. Lift the curtain and end plates into place and bolt the end brackets to the tops of the support angles. 20. Raise and lower the blades as needed to allow the bolts to fit in the holes. 21. Secure the bolts and nuts. Wind the springs one or two turns until the header side of the curtain starts to pull up. Remove 1/4 turn of tension. Record the number of turns. 22. Lower the curtain just enough to allow you to install the two angle guides on each side with the bell mouths just above the bottom bars if you earlier separated the tracks from the longer vertical support angles. 23. Secure the angle guides (tracks) to the longer vertical support angles at this time. 24. If the angles were not separated, install the bell mouths at this time. 25. Check the installation manual and adjust the spring tension as needed. 26. Carefully close the door and check the balance. Adjust the springs if needed. Test the door manually to assure everything is working properly. 27. If there is an operator install the drive sprocket to the drive shaft and secure it. If the operator is mounted to end plate install it at this time. 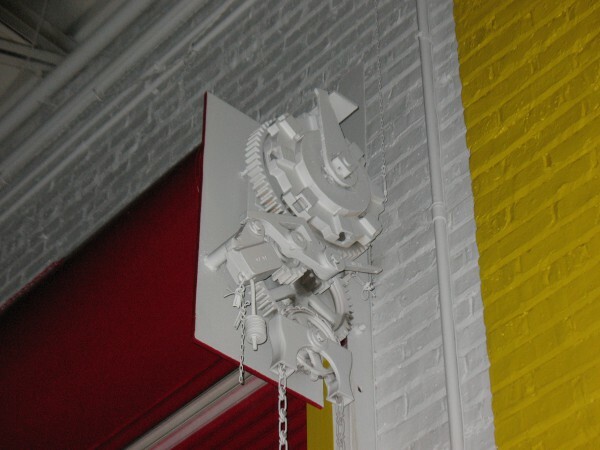 If the operator is mounted to the jamb, install the drive chain at this time. 28. Check and adjust the travel limits as needed. Set the close limit with only a few slats compressing at the bottom. Set the upper limit so that the bottom of the door clears the header, but not so high that the bottom bar hits the bell mouths. 29. If there is a hood for covering the barrel install it at this time. This entry was filed under Another Way to Replace Garage Door Cables. You can follow any responses to this entry through the RSS 2.0 feed.